The commune of Jesenje is situated in the northwestern part of Krapina - Zagorje County, at the northern foothills of Strahinjcica mountain. It comprises the villages of Brdo Jesenjsko, Cerje Jesenjsko, Donje Jesenje, Gornje Jesenje and Lužani Zagorski, with the area of 24 km2 and the population of around 1700 inhabitants. The seat of the commune is a picturesque place of Gornje Jesenje. If Krapina-Zagorje County is known as the romantic heart of Croatia, then Gornje Jesenje would be the untouched, natural heart of Zagorje. We do not claim invaluable historic monuments, but we are proud of our Croatian heart and soul, and , above all, our countryside, the most beautiful in the world. The commune of Jesenje sees its future in hunting and rural tourism; the commune development plan includes also activities in modernising its traffic infrastructure, landscaping , as well as supporting the development of crafts and small and medium sized family enterprises. This is the area well worth visiting for climbing, hiking in the beautiful countryside, scientific research into the local dialects and rich body of folklore and rural customs, delicious food and herbs that this area abounds in. If you want to do some research into the history of the commune, ie. 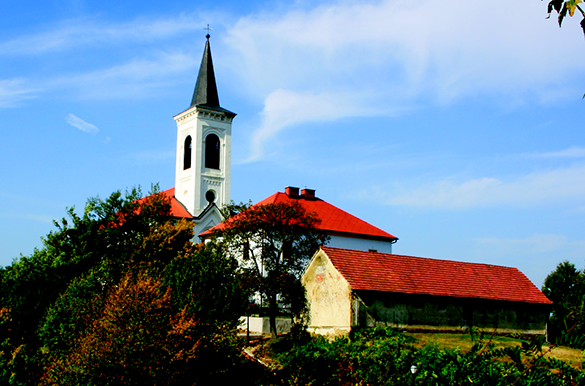 the parish of Jesenje, first you have study the history of the parish of Radoboj, because , since first being mentioned in records of the parish in 1328 , the parish of Jesenje belonged to the parish of Radoboj till 1785, when it was proclaimed an independent parish. The development of education started, according to the available records and memorials of the Gornje Jesenje school, in 1857. According to the available data, 31 pupil was enrolled into school that year. Lessons were given in private houses, the first one being given in the house of the Jedvaj family at Gornje Jesenje. The Church of St.John the Baptist at Gornje Jesenje was started in 1847 , on the spot where an old 17th century chapel used to stand. The church was consecrated and put to service in 1858. While building up their baroque church, villagers came up against serious finantial problems, so that the emperor Franz Josef himself took part in settling them by sending a considerable sum of money, sufficient for completing the works. The church main altar is dedicated to St. John the Baptist, after whom the church is called. It may be interesting to mention that 4 bells in the church steeple were removed during the first world war and used for military purposes. The commune of Jesenje is a typical Croatian Zagorje area with prominently hilly landscape. The climate is of continental-humid type, characterized by moderately warm and rainy summers and cold winters. The average temperature of the coldest month is above 3 degrees Celsius; summers are fresh, with average temperature in the hottest month below 22 degrees Celsius.